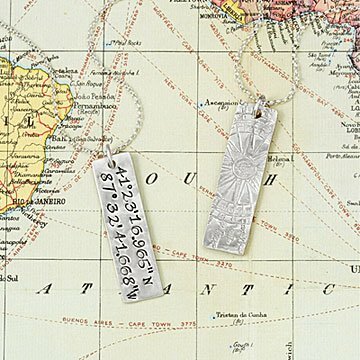 Remember your favorite place with this custom stamped pendant, featuring coordinates close to your heart. Picture for a moment that perfect place: your childhood home, a summertime retreat, or some dreamlike spot you may never see again but cannot forget. Now, imagine being able to carry that place with you always. This keepsake necklace by Ana Talukder will help to keep you grounded in the magic of your special place. Suspended from a sterling silver chain is a hand-forged, solid recycled sterling silver pendant. It pinpoints the place of your choosing with hand-stamped geographic coordinates in latitude and longitude. The reverse side of the pendant is impressed with the image of an elaborate, vintage-inspired compass rose, reminding you to always remain true to yourself. Comes with silver polishing cloth. Handmade in Seattle, Washington. Make it a set! Click here to see the matching Latitude Longitude Charm Bracelet and Latitude Longitude Custom Rings-Set of 2. My wife wears this necklace every chance she gets. She loves it and it is a great conversation piece. In addition to being too short, the chain is not a very good quality. The stamped impression on the back of the pendant is not very clear. Did not look like picture. Was the perfect for my daughter commerating a fantastic trip we took together. It was so nice I have ordered one for myself as well. I ordered this for my wife's Christmas and I had the longitude and latitude of where we met. It is beautiful. ...and she wears it everywhere. My wife loved it! How do I know? She cried. My wife wears it often. It reminds her of what a great relationship we have.